The trecena of Jaguar/IX guides a Transformation by an Experience of living the Dream of a New Awakening of Spirit. Tone 10 is the day of Manifestation when we can see what we’ve created. Tone 10 carries a great responsibility. We will Manifest what we claim to be So. 10 Night/AKBAL marks a Manifestation of Spirit. AKBAL reveals a Light that was created by taking a Leap of Faith toward our new Intention of Being. A Voice of Spirit will be raised in our Consciousness that creates a new Light of Divine Wisdom. An accurate assessment of our Spiritual Progress can only be discerned from within. Night/AKBAL connects us to the Voice of Spirit that speaks to us in our thoughts and dreams. 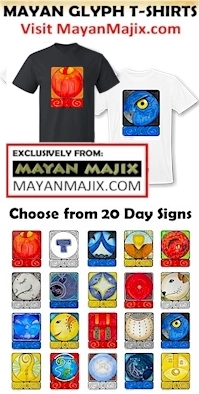 The Cherokee Day Sign of the Hearth, illustrates the Light that Shines in the darkness. The Hearth is a gathering place of Warmth and Light. This is the Sacred Fire tended by the Ancestors that burns through the Night. The Elders help us to manifest the Wisdom from our Experience by raising awareness to our unconscious thoughts, and by bringing together the faculties of our Intellect and Intuition. In my early days on the traditional path, I was often frustrated by teachings that raised more questions than answers. When I asked questions, the standard response from the Elders was, “The Answer is in the Question.” Today I know that our Spiritual Growth is an effort of answering our own questions. A question raised in our mind is a Voice of our own Spirit that calls us into the process of Divine Discernment. Many times the Answer is presented as a Higher Question. For example, we might attempt to discern the meaning of a dream, when the Higher Question is “where did it come from?” What drew my attention to try to figure it out? Our Transformation of Being is all about the questions we ask our Self. Higher Consciousness is simply an engagement with the thoughts that otherwise remain in our unconsciousness. Questions call attention to our own thoughts. AKBAL offers a Communion of Spirit that manifests through our unconscious thoughts. AKBAL days are often experienced as a “dreamy” state of mind. Our reality might feel a little fuzzy. This is a day to pay attention to the “voice of a dream” we may hear in our sleep or while awake. AKBAL is a Blue Day Sign of Water, the element of Spirit that touches our Emotions. Residing in the West, AKBAL relates to our experience of living in the unknown that triggers the Human Response of our Feelings. Our Feeling are the language of the Heart. Akbal’s Voice can answer the questions that are expressed through our emotions. Night/AKBAL is often the day of a Spiritual Experience we might see as a Breakdown that leads to a Breakthrough. This is a day to Honor our Emotions and to share them with the Creator. Our emotions speak more to the Creator than our words can ever say. AKBAL can answer a Question that lies in our Heart. We will be able to recognize the Divine Source as we receive the Answer we most needed to hear. Akbal is often a day when I find myself questioning the circumstances of my life, seeing all I would hope to have created. We may associate our challenges and struggles as the consequence of our own weakness. Wind/IK encouraged us to hold Faith and avoid negativity, understanding that our Dreams must be fulfilled in their Divine Timing to maintain the Harmony and Balance of the Whole. AKBAL can offer the gift of Knowing that no weakness within ourselves will prevent us from manifesting a Dream of Higher Spirit. We are made capable to Claim our new Communion of Spirit, through an Answer that expresses Unconditional Love. Night/AKBAL is a day of mystical experiences. Night is a symbol of the void. AKBAL vanquishes our fear of the dark, so we can enter a place of all possibility where the Unknown can be made Known. My daughter just called as I was writing, asking a question about how to set filters in hotmail. Part of my role at work is to answer technical questions, so I guess I could be considered an “elder” of email. I did what I have done so many times at work. I immediately turned to Google. The results offered steps 1, 2, 3, and provided an illustration of screenshots. The frustration that presented itself was that I couldn’t see what she was seeing. The question was finally resolved when she searched Google for herself. I claim that Synchronicity is more than a coincidence. I claim that we are always in Communion with a Divine Consciousness that knows our thoughts and captures our attention through Divine Timing. I claim that our questions are a Sacred Calling to a Divine Discernment that shows proof of our Connection to the Creator. To all my relations, may we heed a Calling of the Heart that presents a question about our Self. By allowing ourselves to Feel our Emotions in Communion with the Creator, we can hear an Answer that could only be given from a Divine Source. May we know that the answers to all our questions are held within. A Light is always held aloft to see our way through the darkness. By this Light we can face our unknowns willingly, in Faith that we will be shown the way. We are presented with an Offering of Spirit that we can Manifest in our Life, as we Hear and Claim a Communion made possible by an Intention to Live in the Faith of Spirit.